Cancer – This word is enough to scare anyone. It seems like life has come to an end, one feels like there is no hope in life. No doubt cancer is an ugly disease but if one has strong will then you can overcome anything. Here we are talking about cancer of urinary bladder and will also discuss all the aspects of disease in detail. Ayurveda is the new ray of hope to manage this problem. According to Ayurveda, cancer is called as Granthi Roga. Cause of cancer in Ayurveda is imbalance of tri doshas - vata, pitta and kapha. To manage this problem use of herbs is fruitful since ages. Herbs help to stop the growth of cancer cells and encourage the growth of healthy cells. WHAT IS URINARY BLADDER CANCER? As its name indicates it is a type of cancer of the bladder. Bladder is the part of excretory system and its role is to store the urine before urinating. Urinary bladder is made up of different layers. Generally cancer of urinary bladder starts with the innermost layer which is called Urothelium or transitional epithelium. 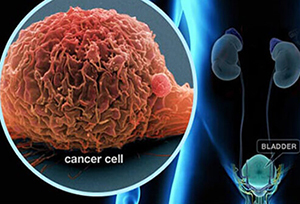 When cells in the urinary bladder start to grow uncontrollably, more cancer cells develop, so as to form a tumor and spread to other areas of the body. Blood in Urine (Hematuria) - Urine may appear bright red or cola colored. Or urine may appear normal, but blood may be detected in a microscopic examination of the urine. Note - Make an appointment with your doctor if you have any signs or symptoms that worry you, such as blood in your urine. Exact cause of bladder cancer is not known. It can be linked to smoking, a parasitic infection, radiation and chemical exposure. Planet Ayurveda offers different formulations like tablets, capsules, and powders etc. which are prepared from pure herbs. These medicines are free from any chemical, preservatives and have no side effects. They provide herbal medicines for the management of urinary bladder cancer which are explained below. These are pure herbal capsules obtained from a combination of herbs which are very well known for their actions - Shallaki (Boswellia serrata) and Curcumin (Curcuma longa). These herbs possess anti-inflammatory properties and manage the symptoms associated with urinary bladder cancer. These herbs are very helpful in various health problems. Dosage - 2 capsules twice daily. This is another herbal preparation which is prepared from combination of various herbs – Punarnava (Boerhavia diffusa), Varun (Crataeva nurvala), Gokshura (Tribulus terrestris), Shudha guggulu (Comniphora mukul). Benefits - This herbal formulation is very useful in case of various health problems like kidney problems, urinary tract infection etc. Punarnava has diuretic, emetic, laxative and stomachic properties. Varun has the property to remove toxins from the body and manage overall kidney functions. This property to manage all the symptoms associated with Urinary bladder cancer. Dosage - 2 tablets thrice daily. Benefits - All these herbs are packed with various medicinal properties. These are helpful to manage all three doshas in the body. This formulation has antioxidant properties which help to remove free radicals from the body. It enhances the immunity of body and helps the body to fight against various types of cancers. These are pure herbal capsules obtained from extract of herb Ashwagandha (Withania somnifera). This herb has great medicinal values which are used to maintain overall wellbeing. It also gives strength and immunity to body. Dosage - 1 capsule twice in a day with plain water after meals. Shilajit capsules are prepared from pure natural compound Shilajit (Asphaltum). It has great medicinal properties and has the ability to improve the immune system. It also has antioxidant properties which help to remove the toxins from the body. It helps to maintain overall health and wellbeing. The Ayurvedic herbal formulation is in tablet form which is prepared from five herbs which are listed below. Benefits - The herbs used in this formulation are useful in renal disorders. These herbs increase the urine quantity and balance all three doshas i.e. vata, pitta and kapha. It helps to eliminates excess water, helps in burning sensation and gives strength to the renal system. This formulation have the ability to improve immunity and provides strength to the body to fight against various disease condition. It has diuretic action. Dosage - 2 tablets twice daily. This formulation helps to manage all symptoms associated with the urinary bladder cancer. Dosage - 1 capsule twice daily. Mixture of all these, make 60 sachets, give 1 sachet twice daily with honey after meals. WHY SHOULD ONE GO FOR PLANET AYURVEDA?.